Congratulations to Elissa of BlueRoofDesigns on her winning entry in the 2010 BEST Team Challenge for the BEST Zombie Award! 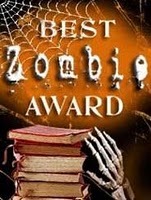 Her Show Me the Mummy - An Accordion Book of Horror received the most votes and is hereby officially awarded the 2010 BEST Zombie Award! Elissa wins all associated bragging rights, to be used at her discretion, for a full year. She can also make liberal use of the BEST Zombie Award graphics. And finally, here is a closer look at her and the winning book! The winning book is a one-of-a-kind accordion book, perfect for celebrating Halloween or your own mummification. Elissa has name this cursed soul Odjinebimdjai, but his friends call him Odji. 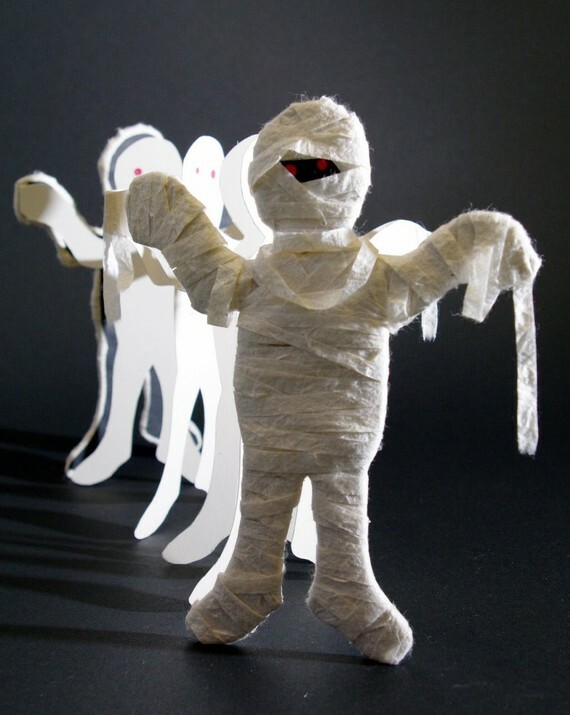 According to the Mummy Name Generator, Odji’s name translates to “wicked panther soldier”. This rings true for him because not only does he like to say “wicked” a lot, but he also likes to eat a panther every morning for breakfast before he starting his day. Odji is wrapped in a soft Unryu paper, which is made of 100% kozo fiber. Odji loves this material because it moves with him while he does his afternoon yoga. When she is not hunting down mummies, Elissa enjoys making blank books – each book is meant to be transformed by the owner. She considers it “accessible art.” The owner of one of her books will put his or her own life experiences into the book, making it truly one-of-a-kind. Her training in Art Therapy drives me to create objects that allows others to tell their stories. Read the interview with Elissa. Visit her shop: BlueRoofDesigns on Etsy. I saw this mummy book a little while ago and thought how original it was, I particularly felt the use of japanese paper for the wrappings was very cute. Congratulations from one binder to another.